Grammy-award winning music producer Christopher King is known for putting together definitive musical collections from the early 20th century. His latest release is a CD of popular war recordings entitled 'Bloody War: Songs 1924-1939'. It was a chance, King says, to expose folk and country music buffs and others to war songs from Civil War, the Spanish-American War, and World War I, which differed greatly from most modern tunes about bloody conflicts. King and co-producer Josh Rosenthal of Tompkins Square Records hope to have a two-fold impact with the CD, bring unfamiliar music to the fore and using some of the profits from sales to help those who have served in recent conflicts. A portion of the proceeds will go to a foundation, Iraq and Afghanistan Veterans of America. Rosenthal called the project very personal. Even though his doesn’t have a direct connection to either war, he does have several family members who fought in combat for this country. It helped instill in him a desire to do something. The CD, which contains 15 tracks, was an outgrowth from a previous project the two producers worked on in 2007. That three-disc compilation, entitled “People Take Warning,” almost included war songs. They waited instead, but this still feels like a fourth CD to that set, Rosenthal said. Both producers said the first track on the album, “Just As The Sun Went Down,” recorded in 1936 by Zeke Morris, is their favorite and timeless. 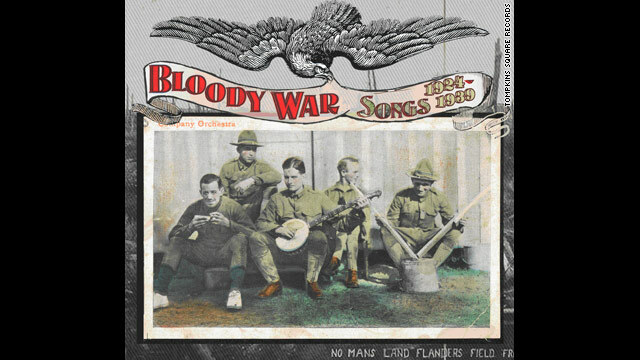 But as "Bloody War," … poignantly attests, there was a time in this nation's history when songwriters engaged their subject in terms more personal than polemic - a time when singers were less concerned with ideology than with the human costs of war, especially among their working-class families and neighbors, many of whom paid the price. “Bloody War” is available at major online retailers. WTH people???? This is about a CD of war songs from 1924-1939!!!!! Let's just discuss the CD! I want to check it out. My son, an Army PFC, is gone now and perhaps this blog should be about OUR soldiers, past and present, as opposed to your rants of an entirely different subject. "All gave some, some gave all." Shut up! Why don't You both grow up and take Your fighting in E-Mail... It is not right the rest of Us has to see Your stupidity!!! I feel sorry if You really Believe that??? A Person that doesn't Believe in GOD doesn't believe in hope that This World will some day get better for all!!! Because only GOD can make that happen not man... Why do You think there is so much Damage going on in the World??? GOD is warning all the Countries to either start getting along with Each Other are God will have to do it for Us!!! Are You saying that the US and NATO are the ones that is fighting the War against the Muslin Religion??? If so You are completely wrong... We are trying to stop the innocent People from being killed!!! I'm sure the Majority of the People there understand that!!! Great idea and I will most certainly buy this album. One thing though...the songs are from 1924-1939...so why is there a photo of soldiers from the WWI, (1914-1918) on the cover? I suppose there may be songs from that era as well. Never-the-less, great idea and a must buy if you want to help in some small way, the troops. Could it be because they couldn't get Pictures of Their People??? What the hell is wrong with these boards? Half the comments here aren't even close to being related. CNN, moderate better. Look how they run thread to thread. idiots arguing with idiots while others die. Stay out of conversations when you have the intellect of a goldfish. That was a conversation between representatives of the two sides of this war. Go back to polishing your gun collection and sniff some of the bore solvent again. How about instead I just poison some little girls, or bid on some "dancing boys" like a good Afghani man? Another Child that wants to play with Us Adults!!! Man, you guys are tripping me out! "Free Kashmir – Syed Ali Gilani on Indian Occupation"
You can set an example for them, give them hope. Hamas said it would strike the Palestinian Authority if the PA does not stop arresting its West Bank followers. In an announcement released Wednesday and reported by Israel Radio, Hamas threatened the Palestinian Authority. I would ADVISE YOU to learn about it before you speak on it...The major population of Afghanistan wants to live a good honest life..most of them are hard workers who raise their kids as well as they can, putting them through school (when there is one near them) ..There are not enough resources at hand for them..Its a corrupt goverment, and segregation between villages that hold them down. The Taliban!! !..If YOU had talaban in every neibhorhood , you think you would go against them..I dont think so..It takes years to change a country that only knows 1 thing , WAR..